On Sunday night, Byungchan (Chan) Lee was announced as the winner of the 2014 Golden Violin Prize, awarded each year to a current student at the Schulich School of Music for their exceptional talent and contribution to musical and cultural life at the School. Lee was one of the runners up in last year’s competition. Byungchan (Chan) Lee is living proof that persistence pays off. Of course, being immensely talented doesn’t hurt either. On Sunday night, Lee was announced as the winner of the 2014 Golden Violin Prize, awarded each year to a current student at the Schulich School of Music for their exceptional talent and contribution to musical and cultural life at the School. Lee was one of the runners up in last year’s competition. 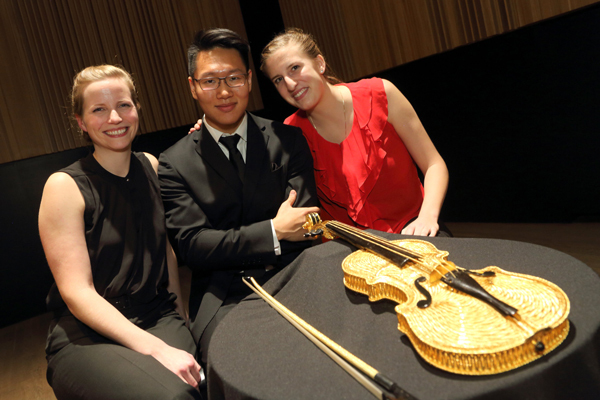 Lee was announced as winner of the Golden Violin following a public performance by the three finalists – Lee on violin, cellist Andrea Stewart and Elizabeth Skinner on violin. 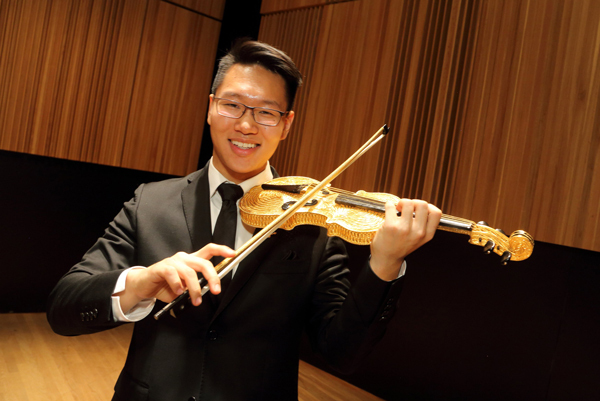 For his award-winning performance, Lee played Eugène Ysaÿe’s Sonata for solo violin, Op. 27 no. 3 in d minor, Ballade; Wolfgang Amadeus Mozart’s Adagio in E major, K. 261; and Richard Strauss’ Sonata for violin and piano in E-flat major Op. 18. The Golden Violin itself, made of pewter and gold plate is on permanent display in Schulich’s Marvin Duchow Music Library and was a gift in 2006 from businessman and philanthropist Seymour Schulich. On top of getting a 14-karat gold lapel pin in the likeness of the Golden Violin, Lee will also have a winter debut recital at Schulich, part of the CBC Next! Series, as well as a noon hour recital next season in Toronto at the Richard Bradshaw Amphitheatre of the Four Seasons Centre for the Performing Arts. Lee will also receive a cash award of $25,000. Born in Seoul, South Korea, the 20-year-old Lee started the violin at age 6 at the urging of his mother. “My mother chose the violin for me; deciding to pursue the instrument and the study of classical music was my own decision,” said Lee. When his family moved to Vancouver, he continued his studies with Taras Gabora. The Golden Violin is another high point in Lee’s burgeoning career. In 2009, he was second prize laureate of the Yuri Yankelevitch International Violin Competition. He was concertmaster of the National Youth Orchestra of Canada in 2010 and 2011, the Vancouver Youth Symphony Orchestra from 2010 to 2012, and the McGill Symphony Orchestra in 2013 and 2014. He was featured as soloist with the Vancouver Symphony Orchestra in 2012, the McGill Symphony Orchestra as winner of the 2013 McGill Concerto Competition, and will be guest alumni soloist with the VYSO in May 2015 at the Chan Shun Concert Hall in Vancouver.